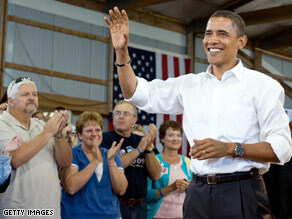 Sen. Obama campaigned in Indiana Saturday. (CNN) - Sen. Barack Obama - locked in a tight presidential race against Sen. John McCain, widely considered a war hero - said in an interview broadcast Sunday that he once considered joining the military himself. Speaking to ABC's "This Week," Obama said, "You know, I had to sign up for Selective Service when I graduated from high school. And I was growing up in Hawaii, and I have friends whose parents were in the military. There are a lot of Army, military bases there. And I actually always thought of the military as an enobling and, you know, honorable option. "But keep in mind - I graduated in 1979. The Vietnam War had come to an end. We weren't engaged in an active military conflict at that point. And so, it's not an option that I ever decided to pursue." On the stump, Obama has praised McCain for his service in the Vietnam war. The two candidates' stark differences over the Iraq war mark one of the central issues of the campaign. The McCain camp argues that McCain's experience has prepared him to serve as commander in chief and lead the United States through the wars in Iraq and Afghanistan. His running mate, Alaska Gov. Sarah Palin, said in her speech at last week's Republican National Convention that while Obama and his running mate, Sen. Joe Biden, "have been going on lately about how they're always, quote, 'fighting for you,' let us face the matter squarely: There is only one man in this election who has ever really fought for you... in places where winning means survival and defeat means death." In the "This Week" interview, Obama also expressed regret for how he handled a question about the Saddleback Civil Forum on Presidency last month. At the time he said answering a question about when a baby gets human rights is "above my pay grade." Asked by ABC whether that answer was "too flip," Obama answered, "Probably, yes." He added that as a Christian, "I have a lot of humility about understanding" when the soul enters into the body. "And so, all I meant to communicate was that I don't presume to be able to answer these kinds of theological questions." "What I do know is that abortion is a moral issue, that it's one that families struggle with all the time, and that in wrestling with those issues, I don't think that the government criminalizing the choices that families make is the best answer for reducing abortions." On a lighter note, "This Week" host George Stephanopoulos jokingly asked Obama whether he'd ever be willing to take on Palin in a game of one-on-one. Both were avid basketball players in their school days, with Obama earning the name "Barry O'Bomber," and Palin nicknamed "Sarah Barracuda." "You know, I would play her a game of horse. She looks like she's got some game," he said, adding, "I know she's a sharpshooter... I probably wouldn't do target practice with her. I think she'd be a better shot than me. But on the basketball court, I think I'd stand up pretty well." He agreed with host Stephanopoulos' suggestion that the game "would break all Nielsen records." Right now, we need a Wise Leader > Good Soldier. With the state of the economy and the war, Obama should be so far ahead in the polls. He is blowing it. I was impressed with McCain's Vietnam survival story the first time I heard it. And the second, and third and fourth and fifth and sixth and seventh and eighth and ninth and tenth times. But now, I'm tired of it, quite honestly. Lots of good American soldiers survived torture in enemy military camps. Does that mean they're ready to be President of the United States? I want a president who represents change, and McCain/Palin, at least to me anyway, represents more of the same. And I'm also tired of the Conservative Base electing this nation's President and Vice-President. The Conservative Base elected George W. Bush, not once but twice. TWICE! AND LOOK AT THE MESS WE ARE IN. Obama may not have previous gubernatorial/mayor experience, and neither does McCain. But I do know that Obama is intelligent, and thoughtful, and willing to talk to our enemies before we decide we should start bombing and killing them, risk more American lives to try to impose our will on a foreign nation based on lies and deceit. I'm tired of lies and deceit. McCain/Palin represents more lies and deceit, more flash-in-the-pan Republican gloss and sheen. It's time for change, America. It's time for We, The People to stand up to the Conservative Base and take back our country from these deluded moralizers. We know that when government sends money to a state or organization or buys a product or service 100% of that money comes from a collected tax. We know that business pays taxes from profits and individuals pay taxes from the wages earned by working for business. We know that for a country, state or local community or household to grow they need more cash. More cash has to come in than goes out or that entity is going broke. Small town America, with fewer jobs, is spending more beyond its borders than taking in and is shrinking at 1% per year. States and Cities without a vibrant business community are doing poorly. Hence the ads on TV asking "build your business here". What are earmarks? Instead of deciding and voting individually on what money government will send back to which state or organizaion or buy, our representatives in congress and senate, have got stuck with lumping a lot of spending proposals together allowing "small" unpopular spending projects to attached to large popular spending projects. Voting for one, votes for all. Thus using fear as a tactic to garner votes, voting no because of an earmark or two can be sold in elections like this as voting against the main and popular title. Small projects, like small town America, when added together represents a huge number coming from our tax dollars. US government is intended to fund projects that are in the interest of most of the people in the US. Earmarks are a way to circumvent that intention. Some would say introducing an earmark is of questionable integrity because the earmark can be in other than our national interest. The persons introducing these earmarks are hoping to be hidden behind an important project. Major projects are often laced with earmark projects because of that feature. Wouldn't it be news worthy to know who introduces which earmark and their individual running total? So when we say this state or that received earmarks we need to look at how that state used the funds to be sure that funding was used as an earmark of less than national interest. Bring up, of course, accountability issues. Where there is money, there is corruption. City after city in the United States have in their history stories of corruption, using public money for non-public benefit. Corruption exists primarily because of mob mentality, that is going with the crowd and not investigating for yourself. We vote and we need to use that vote wisely. We need to do our own research. If corruption exists it exists because we the people have not kept our eye on the ball, instead went with the mob mentalitiy. Recent events, admitted bias, in a our news industry have made it very difficult to use output of the news industry as an information gathering resource. In my opinion the news industry is gracefully moving towards mob mentality in search of increasing profits. When there are as many news outlets as we have today there is extreme competition for our attention and thus advertising dollars. Good news has a history of not selling to the public. When good news does not sell the news business, to survive by attracting advertising, needs bad news to sell its products and the news industry has the resources to find bad news. In the end the good news for the news industry is when advertiser pay them for time or space which is a direct result of how their news sells. Now read this article or any other and ask yourself is the information intended to attract readers? In that vain does this article feed the mob mentality?